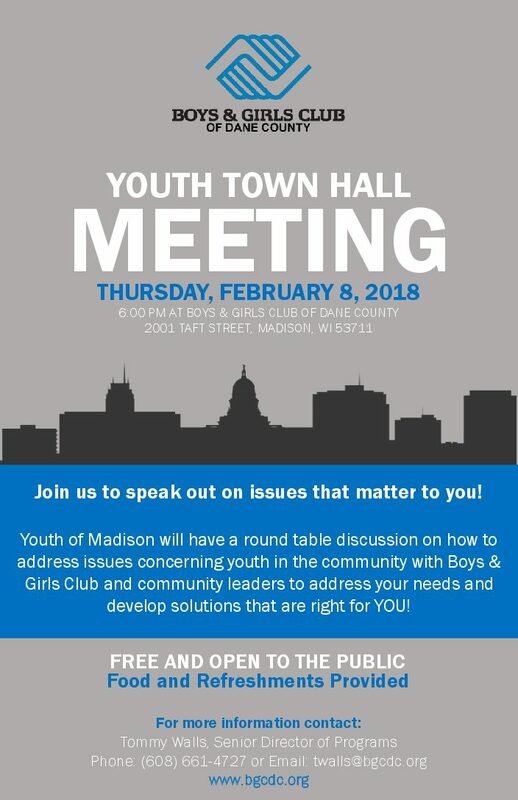 On Thursday, February 8, 2018 a 6:30 pm, Boys & Girls Club of Dane County will host a Teen Town Hall Meeting where youth of Madison will have a round table discusion on how to address issues concerning them and develop actional outcomes and solutions. The Teen Town Hall Meeting will take place at the Taft Club located at 2001 Taft Street and is open to the public. Food and refreshments will be provided. If you’re a teenager or a parent of a teen, you won’t want to miss this opportunity for youth to provide input to issues that concern them. We look forward to hearing from you!